Home > Alaska Fishing Industry Employment Overview > Your Alaska Seafood Industry Job Questions Answered by the Experts! Your Alaska Seafood Industry Job Questions Answered by the Experts! As a member of AlaskaJobFinder you will learn how to get a job from real experts in the industry. Our editorial staff are continually interviewing dozens of professionals, including deckhands,seafood processors, employer hiring managers, lodge workers, and others. Each of our carefully selected experts share dozens of job hunting tips and explain what the work in Alaska is really like. 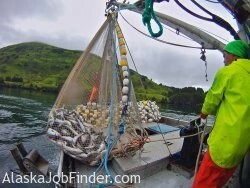 Exclusive AlaskaJobFinder interview with a purse seining skiffman on a herring purse seining boat in Alaska. This Q&A interview covers what it’s like to work as a greenhorn on a purse seiner in Alaska. Brian has worked in the Alaska seafood industry for over 20 years. Learn about his job as a deckboss. The commercial fishing industry isn’t just for men! Sierra has been rockin’ it on a purse seiner for years. She explains the work and the fishing life in great detail. A crabbing deckhand recounts his experience as a bait boy & life aboard a crab vessel. Shore-based setnet operations need crews every summer. One worker talks about the experience she had in Kodiak. In this interview you’ll learn about the job responsibilities on a bowpicker fishing the Copper River Flats. It ain’t easy being green! We mean “greenhorn.” A first-timer explains his experience fishing for King Crab. Are you thinking about working on a fishing boat? If so, then read the advice in this interview carefully – FIRST. In this exclusive AlaskaJobFinder interview a fisherman with 15 years of experience shares tips for getting hired and surviving the experience! You may have heard stories of big bucks made by commercial fishermen and women in Alaska. Yes? In this interview one fisherman talks money and more. Many longliners in Alaska fish for Blackcod and Halibut. Learn how longliners operate, how many crew members are needed, and more. Bristol Bay is the sockeye salmon capital of the world. In this interview you’ll find out what salmon fishing in The Bay is truly like. Women – there’s a place for you in Alaska’s commercial fishing industry. Don’t believe it? Check out this interview for confirmation. The responsibilities of a skipper on a commercial fishing boat are outlined in this interview. Plus, what do skippers look for when preparing to hire new crewmembers? Get the answers here. Learn how one fishing industry vet rose through the ranks over a 16 year period. And he offers tons of tips for making the most of the experience at sea.